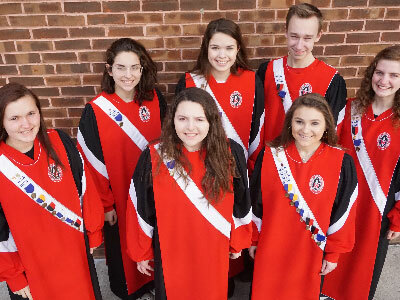 Warwick High School will have eight vocal students attend the 2019 PMEA Region 5 Chorus Festival. The concert will be held at Muhlenberg High School on Saturday, March 23nd starting at 1 p.m.
Students performing in the festival include sopranos Lauren Epps, Alaina Fry, and Heather Mitchell. Rounding out the altos are Isabella Goss, Kayla Bassoff, Amelia Fair and Katherine Bender.Andrew McCracken qualified as a bass vocalist. Freshman, Aj Germaine, qualified as a tenor but due to PMEA rules cannot compete until he's a sophomore. The guest conductor for the festival is Ryan Beeken, who serves as the director of Choral Studies at the Indiana University of Pennsylvania where he conducts the University Chorale, Chorus and Chamber Singers. Beeken also teaches graduate and undergraduate choral conducting.Prior to teaching at IUP, Beeken taught at Michigan State University. "Eight Warwick High School Vocal Music Students have led the Festival Series with great success. Two of the eight came in first in their section and others scoring very high in competition throughout the process of County, Districts, and now Regional Chorus. Good luck to these students who have been working towards All-State Chorus since May of last year," stated Mrs. Deb Kline-Smith, music teacher at the Warwick High School. Congratulations to the Warwick vocal students for qualifying it to the next level in PMEA.